Our annual ceremony to honor those individuals who have made significant contributions to the sport and culture of surfing will be at 10am on Thursday, August 2, 2018 in front of Jack’s Surfboards (located on the corner of PCH and Main Street). Later that morning, the inductee class of 2018 will be joined with select honorees from the past 25 years. The Induction Luncheon will be held across the street at the pavillion "Pier Plaza where you can meet inductee's and mingle with friends. The luncheon is catered by Duke's Restaurant and cost $40. per person. Tickets are available in our gift shop. In the 25th anniversary year of induction, the sidewalk surrounding Jack’s is now covered with more than 150 granite stones representing the champions, heroes and legends of our sport. Huntington Beach, CA – May 3, 2018 – The votes have been tallied and fresh crop of legendary wave riders will once again be forever enshrined in surfing’s history books on August 2, 2018 at 10:00am in Huntington Beach, California. Through a selection ballot, a host of respected surf industry veterans, former professionals, current inductees and surf journalists narrowed down a field of hundreds of candidates to name the 2018 Surfing Walk of Fame’s honorees in their respective categories: Mick Fanning (Surf Champion), Ben Aipa (Surf Pioneer), Bob McKnight (Surf Culture), Stephanie Gilmore (Woman of the Year), Randy Lewis (Local Hero) and Fernando Aguerre and Steve Van Doren (Honor Roll). Celebrating a landmark 25 years of honoring surf legends, the Surfing Walk of Fame is the only tribunal in surfing to award specific categories as well as require a 10-year margin since the commemorating achievement. This year’s recipients will be cemented alongside past inductees, earning their immortal place in the pavement on the corner of PCH and Main Street, directly across from the famous pier in Surf City USA — Huntington Beach, California. Three-time World Champion Mick Fanning headlines the group on the heels of his recent runner-up finish at the Rip Curl Pro Bells Beach, which also happened to be his final competitive sendoff into retirement. The Gold Coast native amassed 22 World Tour victories and 11 Top 5 finishes over his illustrious 17-year career. But just because the jersey is off, doesn’t mean his surfing will slow down anytime soon. Legendary Hawaiian surfer/shaper Ben Aipa will be commemorated in the Surf Pioneer category. Aipa was on the forefront of high-performance surfing and innovative surfboard design throughout much of the 1960s and 1970s. He’s widely credited for inventing the swallow tail (named after the bird) and taking it one step further by adding the “sting” — a wing along the rail ahead of the tail. Quiksilver cofounder and longtime CEO Bob McKnight takes home the always-colorful Surf Culture plaque. And a duo of surf industry veterans will be cemented on Main Street in the Honor Roll category — Vans Vice President Steve Van Doren and ISA President Fernando Aguerre. While longtime Huntington Beach shaper/surfer Randy Lewis earns the Local Hero achievement. 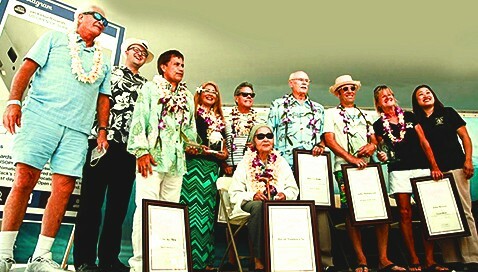 We are fast approaching our Surfing Walk of Fame 25th Anniversary this summer. What a ride! Our International Surfing Museum in Huntington Beach vision became a reality. About 25 years ago, a small group of 6, got together and the rest is history. With over 150 individual and 5 group categories inductees, the Surfing Walk of Fame tells the story of the surf culture like no other place on earth. This coming induction will be spectacular. Details coming soon! The Surfing Walk of Fame 2016 Induction on July 28th. Video Production courtesy of by Matt Liffreing. CLICK HERE TO VIEW OUR 2017 INDUCTION DAY PHOTO GALLERY!